The governing committee of the representative body for mountaineers in England and Wales will face a vote of no confidence at its annual meeting. The British Mountaineering Council’s chief executive Dave Turnbull had cited procedural issues with the motion, but its proposer Bob Pettigrew confirmed the matter will now be discussed at the April gathering. Mr Pettigrew, a former president of the Manchester-based BMC and recipient of the George Band Award, said he had received confirmation on Tuesday this week that the motion would be placed on the agenda for the meeting at Plas y Brenin in north Wales. The deadline for receipt of motions was 5pm on Wednesday. Among those supporting the motion is BMC patron Doug Scott who, along with Dougal Haston, was the first Briton to successfully climb Everest. Mr Turnbull had also said, after taking legal advice, he believed the motion was not in an acceptable form. Any motion to the organisation’s AGM needs 25 voting members to support it; Mr Pettigrew said he has at least 30 signatories to the motion. At the heart of the former president’s complaint is the lack of consultation over the aborted change of name last year to Climb Britain; the increasing move towards competition climbing rather than traditional outdoors mountaineering and over-reliance on Government handouts and commercial funding for its finances. Mr Pettigrew said the BMC is also not complying with good sports governance guidelines issued by the Department for Culture, Media and Sport. 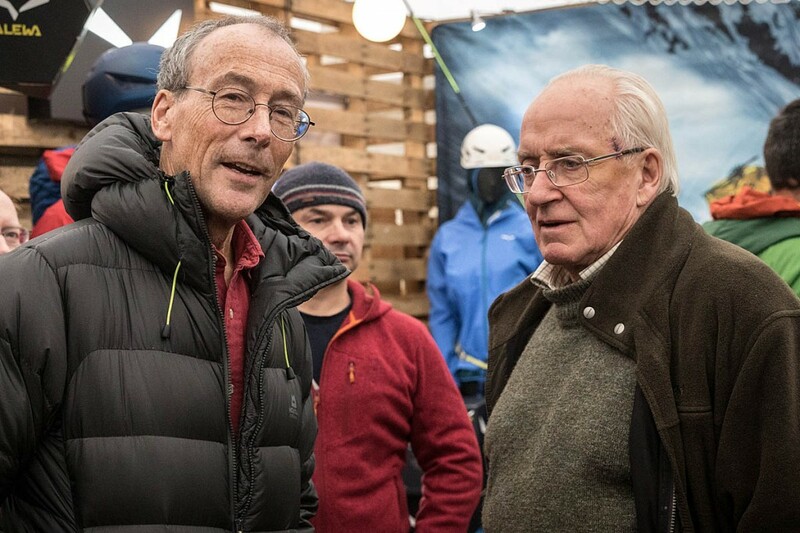 Since climbing was announced as an Olympic sport, Mr Pettigrew said, the BMC had become a sport governing body as well as its original role as a representative organisation. He said the name change decision had been made in March 2016, a month before last year’s AGM at Losehill Hall in the Peak District. The chief executive admitted there are issues over his organisation’s governance and its future development. He offered to meet the members behind the motion at the council’s headquarters – a move rejected by Mr Pettigrew. Writing to the former president, Mr Turnbull said: “I should also like to say at the outset that the BMC fully accepts there are ongoing issues concerning the governance, operation and future development of the organisation (we are in very complex and changing times), and that there must be an opportunity to discuss these at the AGM weekend and in the AGM meeting itself. “For this reason the annual report agenda item at the AGM will include a detailed presentation by the president and CEO of the BMC’s work in 2016 together with an overview of key issues for 2017 and beyond. “This new approach was agreed at a meeting with the BMC patrons held in September 2016, at which Doug Scott made the strong and convincing case that BMC AGMs must be more transparent, give notice of major projects in the pipeline and allow for active engagement with members on important future policy issues. Mr Turnbull said the BMC’s national council had decided to set up a formal working group to review the governance of the BMC and make recommendations as to how it should be improved. “The detailed terms of reference and scope of the review are still under consideration but it is likely to encompass such things as the BMC’s democratic structure, organisational decision making and the respective roles of national council and the executive committee, and how best to deal with the key challenges facing us in the future.” He said. 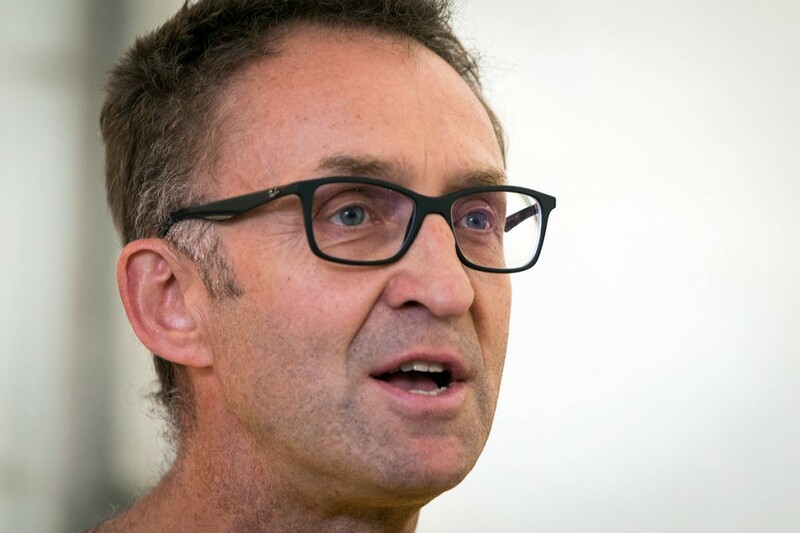 Mr Pettigrew has also been critical of what he sees as the BMC’s acquiescence to the setting up of the International Federation of Sport Climbing and the move away from traditional climbing towards competition climbing. He even disputes the term ‘sport climbing’ used by the IFSC, saying it should be more properly termed competition climbing. Doug Scott also criticised the governance of the BMC and the direction it had taken recently. He said its executive had failed to conduct a review every five years as recommended by the Moulton Review. It should limit the period of tenure of senior staff and avoid becoming dependent on government grants. He said the organisation should promote climbing for its own sake and resist government inducement, via Sport England, to become in effect an arm of the NHS in its campaign to reduce obesity and diabetes. He said: “I therefore support Bob Pettigrew’s motion as it is imperative that change comes about quickly in light of the above. 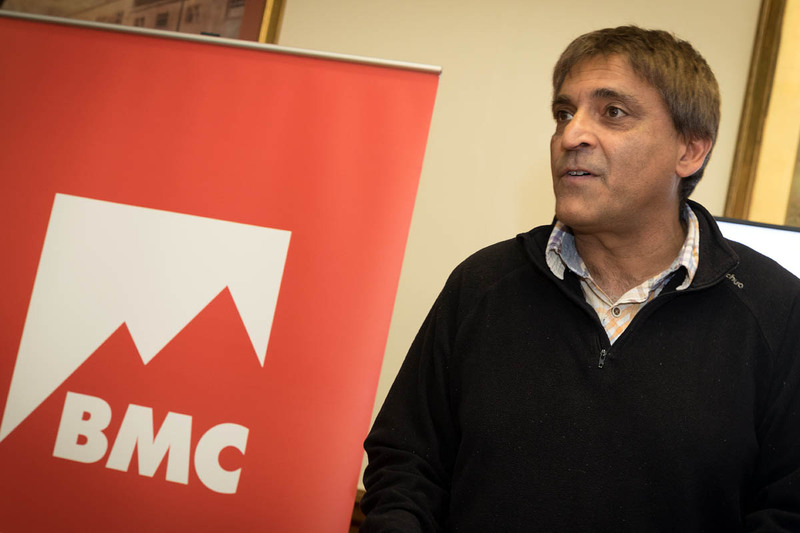 In a statement posted on the BMC’s website on Friday, president Rehan Siddiqui said: “The BMC can confirm that our AGM on 22 April 2017 will include an agenda item from Bob Pettigrew and others calling for a vote of no confidence in the executive committee of the BMC (the board of directors) on the grounds of the ‘wilful and deliberate withholding of future policy decisions from the members in attendance at the annual general meeting,’ in April 2016 and that this was, ‘very poor governance by the executive committee’. Mr Siddiqui said the BMC understood that the future policy decisions referred to in the motion relate to the Climb Britain rebranding exercise. “At the time of the AGM (16 April 2016), any potential name change was a work in progress and it was not until the executive committee meeting of 18 May 2016 that a decision was reached to trademark the name Climb Britain and put it to the BMC’s main policymaking body – national council – for consideration and a decision on 18 June 2016,” he said. “The national council voted unanimously in favour of the rebrand with one abstention. 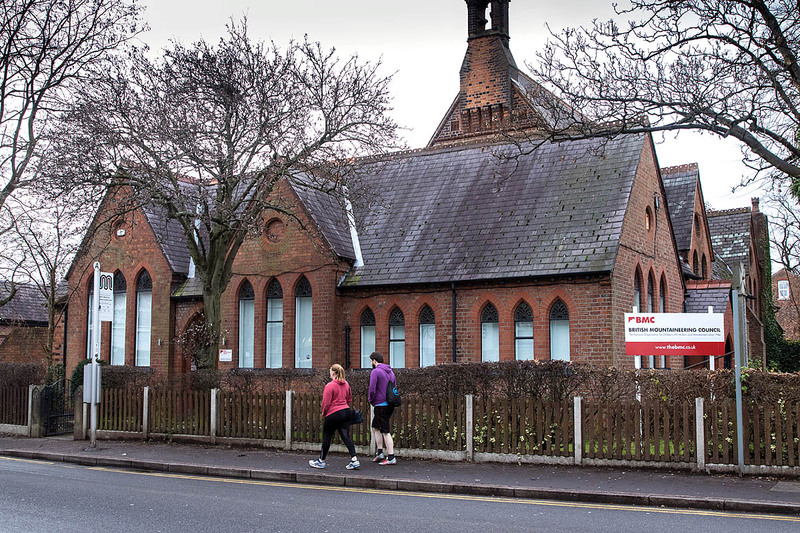 Once member disapproval became apparent, the BMC admitted that this Sport-England-funded rebranding had been a mistake and reacted quickly to rectify this – which shows that the BMC’s democratic process does work. Mr Turnbull has previously said the £25,000 cost of the rebranding was paid for by the publicly funded body. Mr Siddiqui said: “The motion of no confidence specifically does not mention subjects such as the Olympics and governance of the IFSC and members should not be confused into thinking they are voting on these issues through this motion. “As the motion of no confidence has been filed against the executive committee, I would like to ensure that all members are aware of how this body is compiled. With the exception of the salaried chief executive, all members of the executive committee are volunteers and are only appointed for three-year tenures with the exception of the treasurer who stands for five years. “These executive volunteers are highly regarded individuals in their professional spheres and many, like all the other hard-working and appreciated volunteers who assist the BMC, devote considerable time and effort regularly at the expense of their career and family commitments for the good of the BMC. “Tenures are staggered so that the composition of the executive is regularly changing. Some of the policy grievances that signatories of this motion have referred to in public forums are matters that were voted on by national council and executive prior to any of the current volunteer executives being in office. The BMC has 82,000 members, made up of 56,000 individuals and a further 26,000 people from the 300 affiliated mountaineering clubs. Many of these are primarily hillwalkers, a large number of whom will have joined the BMC as part of the compulsory registration process for outdoor qualifications such as the Mountain Leader Awards and Hill and Moorland Leader Award. At the time of the change of name last year, many members said the new name failed to acknowledge the large proportion of its membership that was not primarily involved in climbing. The council’s annual meeting will take place at Plas y Brenin, the National Mountain Sports Centre, near Capel Curig, on 22 April. Bob Smith is a member of the BMC and grough offers BMC members a discount on its grough route mapping and route-planning service. The planned for speech that is to lead on the motion of no confidence - in full just in case you thought I had edited it down somewhat!! MOTION OF NO CONFIDENCE IN THE EXECUTIVE COMMITTEE OF THE B.M.C. THIS PAPER REPRESENTS MY PERSONAL OBSERVATIONS WHICH I SHALL PUT BEFORE THE “BMC THIRTY” AS A WAY FORWARD. IT IS TO RESTORE DEMOCRATIC PROCEDURES TO THE ANNUAL GENERAL MEETING (AGM) OF THE BMC, NOW AND HENCEFORTH. IF OUR MOTION WERE TO BE CARRIED THEN IT IS FOR THE EXECUTIVE COMMITTEE,THROUGH ITS DIRECTORS, TO TAKE REMEDIAL ACTION ACCORDING TO THEIR LEGAL DUTY UNDER COMPANY LAW. OUR RECOMMENDATION TO THE EXECUTIVE COMMITTEE WOULD BE TO SET UP AN INDEPENDENT REVIEW BY ACKNOWLEDGED EXPERTS IN THE FIELDS OF MOUNTAINEERING AND ADMINISTRATION DRAWN FROM A BROAD SPECTRUM OF THE SPORT. WE ARE NOT WRECKERS SO WE WOULD ADVOCATE THAT THE MAIN OPERATIONAL DIVISIONS OF THE BMC CONTINUE TO SERVICE THE MEMBERSHIP DURING THE INTERIM BY STRICTLY ADHERING TO ESTABLISHED POLICIES AND WORK PROGRAMMES UNTIL THE REVIEW IS COMPLETE AND IMPLEMENTED. IF OUR MOTION WERE TO BE DEFEATED THEN IT MIGHT HAVE SERVED ITS PURPOSE IN REMINDING THE GRASS ROOTS MEMBERSHIP THAT, IN THE CONTEXT OF THE AGM OF THE BMC, THEY ARE THE ULTIMATE AUTHORITY TO WHICH THE EXECUTIVE COMMITTEE STANDS ACCOUNTABLE ONCE A YEAR FOR ITS FUTURE POLICIES, PROGRAMMES AND EXPENDITURE. QUI CUSTODIET CUSTODES – WHO IS IT THAT GUARDS THE GUARDS THEMSELVES? IN OUR CASE – IT IS THE AGM SERVICED BY A FULL AGENDA OF FUTURE POLICIES AND WORK PROGRAMMES PRESENTED FOR APPROVAL BY THE EXECUTIVE COMMITTEE AFTER CONSULTATION WITH THE NATIONAL COUNCIL THROUGH THE AREA MEETING NETWORK – WHICH I KNOW HAS STOOD THE TEST OF TIME BECAUSE OF MY OWN LONG EXPERIENCE OF THE VOLUNTARY WORK OF THE AREA ACTIVISTS, AMONGST WHOM I STILL HAVE MANY FRIENDS. BMC AGM 22nd APRIL 2017 at PLAS y BRENIN NATIONAL MOUNTAIN CENTRE. I am Robert Pettigrew, one of thirty listed proposers of the Motion of No Confidence in the Executive Committee of the British Mountaineering Council. Because I am entrusted with the Moving of the Motion, I have become the first among equals for this considered action. or, if unable to attend, cast a proxy vote before the time limit of Monday 17th April next. mountaineering representative, following my distinguished forbears, Lord Hunt of Llanvair Waterdine, and Sir Jack Longland. Like so many of my contemporaries in the BMC, I have had a deep passion for the mountains since I was a schoolboy and became steeped in the mountain literature which is surely unsurpassed in range and content of any sport in the world, and gives our sport a spiritual and philosophical content like no other. This I have shared and enjoyed with fellow members of the A.C., the CC, the Wayfarers, and the Himalayan Club over the years. I have had the good fortune, and with good companions, to make a number of first and second ascents in the Lyngen Alps of Arctic Norway and in the Indo-Tibet (China) border region of the Punjab Himalaya (Himachal Pradesh). All my expeditions are recorded in the Alpine and Himalayan Journals of the period, and”Lyngsalpene” Universitetsforlarget. All were great adventures with loyal companions and a lot of fun, even in retrospect, the broken limbs! By profession I served as an Inspector of Schools in the Further Education Divisions of the counties of Hampshire and Cleveland. My aims and objectives in proposing the Motion of No Confidence in the Executive Committee of the BMC is to restore the democratic process of accountability to the grass-roots membership of the BMC in the governance process. It is undeniably the very essence of the democratic process and it must be restored and maintained. I have attended every one of the BMCs AGMs since I had the honour to serve as president of this great institution and I have observed with growing dismay the diminishing of the AGM in form and content so that the opportunity to hold to account the Executive Committee and the National Council (formerly the Management Committee), and a better title, has also dwindled – to be replaced by an Open Forum – in other words a “Talking Shop” with no constitutional imperatives, and whatever is proposed disappears into the ether with no consequent action of the measures advocated. I personally regard Open Forums as an improper and cynical device to inhibit debate and advocate their removal from the annual programme of events. That would give members more time to discuss and comment on major policy issues – of which there are many. This deplorable decline in the democracy of the BMC reached its nadir at the AGM of last year, the 16th April 2016, when external events, such as the admission to the Olympic Games of Competition Climbing were reaching a climax. Both Mark Vallance, a distinguished former president and alpinist and me were given leave by President Rehan Siddiqui to make speeches warning that momentous changes in our sport were impending due to external forces, for which the BMC must make provision, but the debate was curtailed by what has since been revealed as an hidden agenda known only to the Executive and a privileged few. I emphasise that the bulk of the grass-roots membership assembled in Losehill Hall, Castleton, Derbyshire on Saturday 16 April, 2016, were kept in total ignorance of the momentous events about to evolve. On a lighter note I was even persuaded to buy a T shirt with the BMC logo, when the decision had already been taken to change the name of the BMC! Was anticipated old stock already being sold off? However – all is well since I can still wear it with pride! I had my first intimation that something was badly wrong when a member of the Executive Committee who had listened to my speech came up to me at tea and said:” We don’t want to rock any boats, do we?” Did he really mean – “We don’t want to upset the International Olympic Committee, do we?” We shall probably never know. It occurred to me then that some momentous changes in the BMC were in the making without the knowledge of the grass-roots membership, or any process of consultation with that membership in the democratic process of an AGM when the elected members and paid staff stand accountable for the implementation of policies and strategies and financial probity according to the Code of Good Governance laid down by the Department of Culture, Media and Sport. Subsequent to the AGM of 16 April 2016, a series of revelations about proposed momentous changes in the status, name, international relations, commercial projects, and Olympic ambitions of the BMC began to emerge, none of which had been sanctioned by the grass-roots membership, but all of which had been conceived, planned and developed by the Executive Committee in secret over a time period of several months prior to the AGM of 2016. MR WRAGG IS HOIST BY HIS OWN PETARD! IN HIS REPORT HE CLEARLY STATES THAT THE EXTRAORDINARILY EXPENSIVE RE-BRANDING WAS NOT A CHANGE OF NAME. SINCE RE-BRANDING INVARIABLY MEANS A CHANGE OF NAME – HE- HE GOES ON TO STATE IN HIS REPORT THAT A CHANGE OF NAME WOULD NEED THE APPROVAL OF AN AGM! WHY THEN DID THE EXECUTIVE COMMITTEE WITHHOLD FROM THE AGM AT CASTLETON IN 2016 NOT ONLY THE CHANGE OF NAME (ALREADY MADE IN MARCH 2016 – THE PRECEDING MONTH) BUT A RAFT OF OTHER MEASURES SUCH AS THE INEVITABLE CHANGE OF STATUS OF THE BMC FROM A REPRESENTATIVE BODY TO A GOVERNING BODY OF SPORT AND RECREATION? FORTUNATELY THE AREA COMMITTEES SAVED THE DAY AND CAME INTO THEIR OWN WITH A MASS REVOLT WHICH FORCED AN HUMILIATING CLIMB DOWN BY THE EXECUTIVE COMMITTEE AT LEAST OVER THE ILL-FATED NAME CHANGE. BUT HAS THE LESSON BEEN LEARNED? WHAT OTHER PROPOSED CHANGES IN THE NATURE AND FUNCTION OF THE BMC ARE YET TO BE REVEALED? My fellow proposers and I then determined that the time had come to bring matters to a head and seek a full debate at the AGM to demand transparency and accountability to the membership in the future operations of the BMC. The BMC is a company limited by guarantee and is governed by an Executive Committee, so the conventional process of a Motion of No Confidence in the Executive Committee, is intended to initiate a debate on the Executive Committee’s corporate failure to seek a mandate for its future policies and work programmes from the membership at the annual general meetings, now a chronic annual failure. Should the Motion succeed and become a Resolution I would further propose that an Independent Review of the Structure and modern purpose of the BMC should be set up with the aim of making the BMC fit for purpose. Since the Alpine Club is not only the senior club in the world, it is also the founder of the BMC and has the corporate philosophy and expertise to advise on the personnel able and willing to conduct such a Review under an independent chairman I and my fellow proposers would recommend that it is invited to undertake the review. If on the other hand, the Motion falls, I sincerely hope it will at least have restored the central importance of the Annual General Meeting as the principal agency of governance of the BMC where future policies, strategies, work programmes, staff structures and finances, are openly debated and endorsed or amended by the membership assembled at the AGM. The following candidates were eligible for re-election and were proposed by Bob Pettigrew, seconded by Will Kilner.